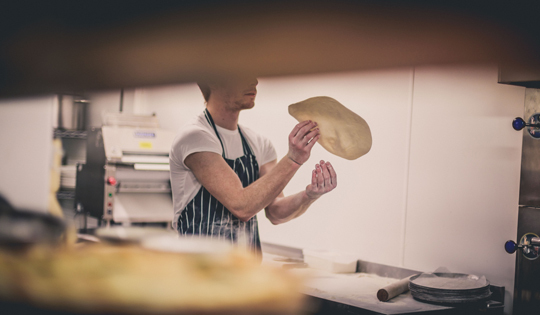 Originally established in Dorset almost a decade ago by ex-music biz whizkids Richard and Nikki Cooper, The Stable brand is synonymous with three key elements: pizza, pies and cider. 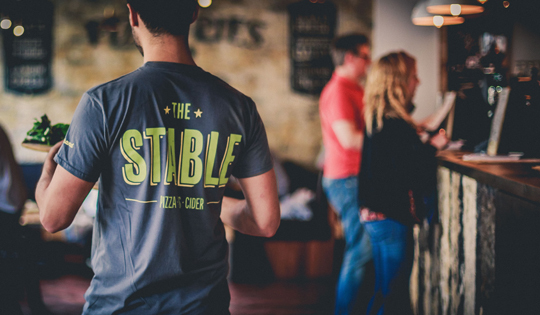 There may currently be 16 branches across the country (largely still in the south west), and it’s true that much of this expansion is largely down to the Stable’s 2014 collaboration with the family-owned Fuller, Smith and Turner brewery, who bought a 51% share in the business back in 2014. But still, the original ethos at the heart of the matter remains the same: all the ingredients that make up the menu in any given Stable branch (and they’re all unique to their own location) are locally sourced, preservative-free and freshly prepared on-site, menus go large on gluten-free and vegan options, and Nikki and Richard’s original vision of creating unique environments in which to pig out on upper-crust comfort food at downhome prices remains intact. Located (rather ironically, perhaps?) in the space formerly occupied by a lacklustre branch of Pizza Hut, our local Stable has become a cornerstone stalwart of the thriving Kingsmead Square merrymaking scene. Once you’ve settled down into your own little corner within a chilled-out, smartly-dressed, relaxing environment, the pies are highly recommended (we love the Steak Out – beef, Abbey Ales’ Bellringer Ale and Bath Blue Cheese) and the pizzas are hearty to say the least, with the Avonmouth Angler, the Longhorn Jim and, of course, the Porky Pancetta currently topping our charts. But menus aren’t all about carbs, carbs and more carbs; if you’re eating clean, the salads (including a harissa-spiced fennel, roast butternut squash and feta incarnation and a positively dapper crab medley) are about as sumptuous as salads get. And to drink? 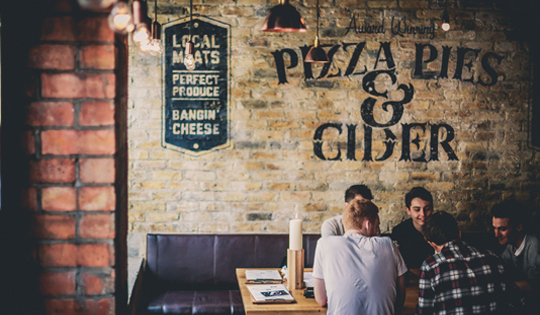 There are 60+ varieties of cider on the menu (and you certainly won’t get bored of the regularly-changing Cider Board, offering five sample tipples for £7.50) alongside all manner of local craft and artisan ales and a super-smart wine selection. Meanwhile, breakfast kickstarters include Eggs Florentine and Royale (yay! ); proper Ploughmans’, wraps and rolls supplement the salads and pizzas at lunchtime; Tuck In Tuesdays (a pizza, a side salad and a drink for a tenner) liven up the most boring evening of the week… and a Kids Menu keeps the little piggies amongst us very happy indeed. If you’re after a slice of straightforward stability, you’ve come to the right place. 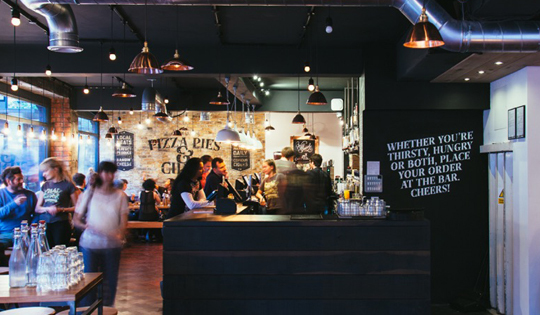 Originally established in Dorset almost a decade ago by ex-music biz whizkids Richard and Nikki Cooper, The Stable brand is synonymous with three key elements: pizza, pies and cider. 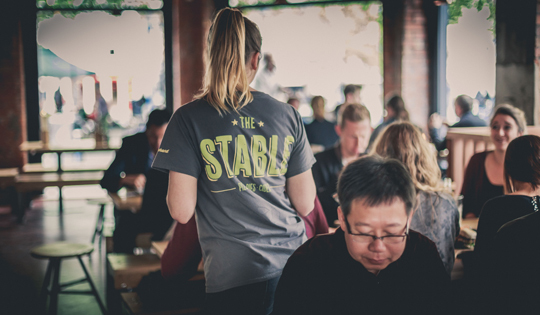 There may currently be 16 branches across the country (largely still in the south west), and it's true that much of this expansion is largely down to the Stable's 2014 collaboration with the family-owned Fuller, Smith and Turner brewery, who bought a 51% share in the business back in 2014. But still, the original ethos at the heart of the matter remains the same: all the ingredients that make up the menu in any given Stable branch (and they're all unique to their own location) are locally sourced, preservative-free and freshly prepared on-site, menus go large on gluten-free and vegan options, and Nikki and Richard's original vision of creating unique environments in which to pig out on upper-crust comfort food at downhome prices remains intact. Located (rather ironically, perhaps?) 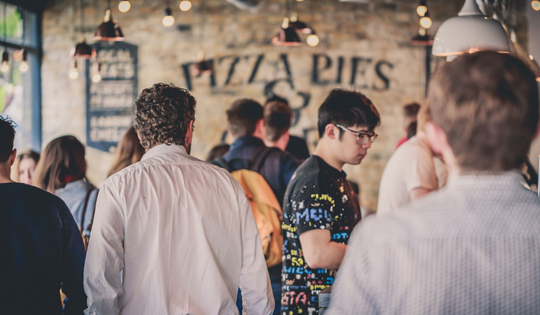 in the space formerly occupied by a lacklustre branch of Pizza Hut, our local Stable has become a cornerstone stalwart of the thriving Kingsmead Square merrymaking scene. Once you've settled down into your own little corner within a chilled-out, smartly-dressed, relaxing environment, the pies are highly recommended (we love the Steak Out - beef, Abbey Ales' Bellringer Ale and Bath Blue Cheese) and the pizzas are hearty to say the least, with the Avonmouth Angler, the Longhorn Jim and, of course, the Porky Pancetta currently topping our charts. But menus aren't all about carbs, carbs and more carbs; if you're eating clean, the salads (including a harissa-spiced fennel, roast butternut squash and feta incarnation and a positively dapper crab medley) are about as sumptuous as salads get. And to drink? There are 60+ varieties of cider on the menu (and you certainly won't get bored of the regularly-changing Cider Board, offering five sample tipples for £7.50) alongside all manner of local craft and artisan ales and a super-smart wine selection. Meanwhile, breakfast kickstarters include Eggs Florentine and Royale (yay! ); proper Ploughmans', wraps and rolls supplement the salads and pizzas at lunchtime; Tuck In Tuesdays (a pizza, a side salad and a drink for a tenner) liven up the most boring evening of the week... and a Kids Menu keeps the little piggies amongst us very happy indeed. If you're after a slice of straightforward stability, you've come to the right place.